The project will map all streams draining more than one square mile. Easy-to-access, science-based information is one of the best tools we have to defend against flooding, says Iowa Flood Center (IFC) Associate Director Nate Young. ted floodplain maps for the 85 Iowa counties that were declared Presidential Disaster Areas after the 2008 Iowa floods. The remaining 14 Iowa counties will be mapped by the U.S. Corps of Engineers. 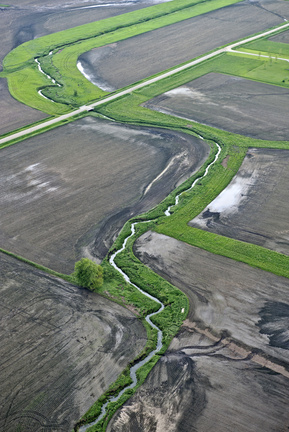 “The maps will provide Iowans with good information concerning flood risk in their own communities, so they can make informed land-use and land management decisions,” Young says. The maps will define the boundaries of flooded areas for 100-year (1 percent annual chance of flood) and 500-year (0.2 percent chance) floods. The new draft flood maps are being posted online at http://www.iowafloodmaps.org as they become available. The flood mapping team began its work in southwest Iowa and is working its way northeasterly across the state (Iowa Floodplain Mapping progress map). Floodplain maps delineating the 100-year (blue) and 500-year (orange) floodplain will be publicly available online. The easy-to-use Google-maps based interface allows Iowans to directly access information about their flood risks. While the entire library of IFC flood maps is being developed to the standards of the Federal Emergency Management Agency (FEMA), not all of the maps will be adopted by FEMA as regulatory documents. The remaining, non-regulatory maps will be available on the website to provide accurate information to Iowans, but will not be considered FEMA regulatory maps. The IFC researchers are using laser radar (LiDAR) data made available by the Iowa DNR to map all streams draining one square mile or more. LiDAR is a remote-sensing technology that allows researchers to develop precise digital elevation models of the land surface. LiDAR data allow the team to describe Iowa’s river and stream networks, develop computer-based flood simulations, and delineate floodplains with reasonable accuracy. According to IDNR Floodplain Mapping Coordinator Scott Ralston, public meetings in each county after the draft flood hazard maps are published will give Iowans a valuable opportunity to learn more and offer comments and feedback. Plans are underway to expand the project to provide more mapping projects of particular interest to farmers. Duane Sand of the Iowa Natural Heritage Foundation hopes to raise $1.2 million for an additional two to five years of work to develop flood maps for the 2-, 5-, 10-, 25-, 50-, and 200-year floods. With just under three years to go before the original mapping work is done, Young says he’s feeling confident that his team will succeed in completing the assignment on time. “We’re gaining momentum,” he says.